I am so excited!! I just realized that this wonderful old movie about St. Therese of Lisieux, made back in 1959, has been re-released! I borrowed it from a friend once, years ago, and have been looking for a copy ever since! Plus, it is now on DVD and has been dubbed in English--before it was just in French with subtitles--so it will be much more child friendly. It is called Miracle of St. Therese. If you'd like, you can order it here . This is the acclaimed dramatic feature film made in France in 1959 that tells the story of the life of Therese of Lisieux from childhood through her death as a Carmelite nun at age 24. Film critics have called it “an excellent, reverent biopic” on St. Therese that accurately portrays the saint’s story and her unique spirituality in a very appealing performance by French actress France Descaut. 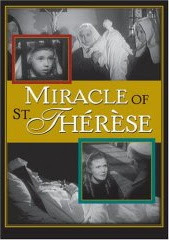 The movie offers numerous glimpses into Therese’s “little way” of spiritual childhood, (her particular charism that helped make her a Doctor of the Church) including situations of conflict between Therese and her mother prioress regarding her conviction of striving for perfection with confidence and trust in the mercy and love of God. Beautifully filmed in black and white, with fine performances by the whole cast, this film is an unsung cinematic gem that captures the spirit and life of the beloved St. Therese. English and Spanish. Movie is shown in B & W.
Anyways, I just thought I would take a second and share it with you. I can hardly wait to order a copy and add this gem to our family collection...but... I will have to, at least till next month. :-) Now... if they would just re-release Teresa of the Andes in the US! "Teresa of the Andes" has frequently aired on EWTN, so you might try and catch it there. It is in Spanish with English subtitles. There is also a movie they have shown on Teresa of Avila, "Teresa De Jesus," in Spanish. No dubbed versions that I've seen, though! However, we have been able to get a hold of the Terese of the Andes on VHS. I just would love to be able to get it on DVD, since we are slowly getting rid of all our Videos. I do like it in the Spanish with subtitles, as I have never really cared for dubbed movies. Sorry, Jessica. I forgot to add that "Teresa of Avila" is also available from Amazon.com on DVD. It's so great that all these movies on Saints are starting to become more readily available. Praise God! BTW, the folks behind "Bella" may do a movie on Miguel Pro (is he a Saint now? ), so everyone, please pray for that! Along with Teresa of the Andes, I just "discovered" Bl. Elizabeth of the Holy Trinity. She is somewhat lesser known, but I'd love to see a movie made on this beautiful young soul of God, too! No problem, Jessica! Also, Teresa of Avila on DVD can be rented via Netflix. I don't know about Blockbuster, but definitely Netflix! Okay, guys, I just looked it up, and the status of Miguel Pro right now is "Blessed," so please keep on praying for his canonization and for the success of the movie that the Metonia guys hope to make! Thanks again Dawn! We love Blessed Miguel Pro. In fact, we have a relic of his. (It is a piece of wood from his coffin!) We are indeed praying for his canonization. I just signed up for Netflix last month, so I am going to log in and add Teresa of Avila to my queue. Thank you for sharing all the information. Actually, Jessica, if you did not already own "Miracle of Saint Therese," you could put that in your queue, too, because it is also available there. In fact, that's how I saw that movie. In my opinion, it is the most profound depiction of Saint Therese's life. The 2004 film was sweet (and is also available on Netflix, BTW), but I found this one to be far more deep and profound, really delving into the depths of her great holiness, as well as the simple profundity of her "little way!" Ignatius Press informed me that they will begin selling the DVD of Teresa of the Andes around September or so. I would assume also that her official site will begin selling it then also, but I don't know for sure. And, of course, it is the version with English subtitles. Yay!